Department of Pharmacology, Shri Vishnu College of Pharmacy, Bhimavaram, Andhra Pradesh, India. Background: Hypertension is the most common and major cardiovascular disease. There is an urgent need for treament of hypertension by exploration of several medicinal plants having potent anti hypertensive activity as the modern medicines are having many side effects. Objective: The study focus on scientific evaluation of antihypertensive activity of ethanolic extract of Lantana camara leaves (EELC) in different experimental models. Material & methods: Antihypertensive activity was conducted on wister albino rats by determining serum glutamic oxaloacetic transaminase (SGOT), serum glutamic pyruvic transaminase (SGPT), creatinine and Sodium levels by using Semi Autoanalyser and Flame photometer; chick mean arterial blood pressure by using condon’s mercury manometer and isolated frog heart for recording cardic responses using student kymograph. Results: EELC produced negative inotropic and negative chronotropic effect, antagonised by atropine on isolated frog heart. EELC shows dose dependent (p<0.05) decreased mean arterial blood pressure (MABP) in anaesthetic chick. Salt treated rats displayed significant (p<0.05) increase in blood level of SGOT, SGPT, Creatinine and sodium, decrease in pottassim levels in comparision with normal rats. Treatment with EELC (200 and 400 mg/kg) significantly balanced the ionic levels such as lower the sodium and elevate the potassium levels. Creatinine levels were signifi-cantly (p<0.05) reduced by the treatment with EELC. There are no significant changes occurred in serum SGOT and SGPT upon EELC administration. The present study suggests that treatment of salt hypertensive rats with EELC protects against renal injuries. Conclusion: It was concluded that ethanolic extract of Lantana camara leaves reduces work load of heart, maintain inotonic levels by negative chronotropic effect, relaxes the smooth muscles in chick and salt hypertensive rats against renal and vascular injuries is proved. 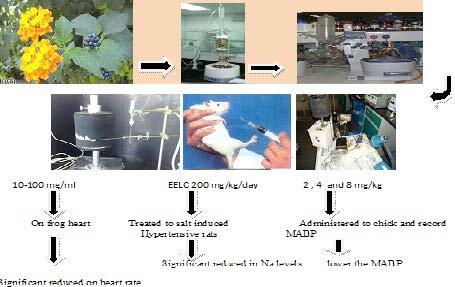 Matta VK, Pasala PK, Netala S, Pandrinki S, Konduri P. Anti Hypertensive Activity of the Ethanolic Extract of Lantana camara leaves on high salt loaded wistar albino rats. Pharmacognosy Journal. 2015;7(5):289-295. Mean arterial blood pressure (MABP) and Normotensive rats (NTR).